Join instructors, students and local representatives the first Wednesday of each month to get a real feel for the programs Peninsula College offers. 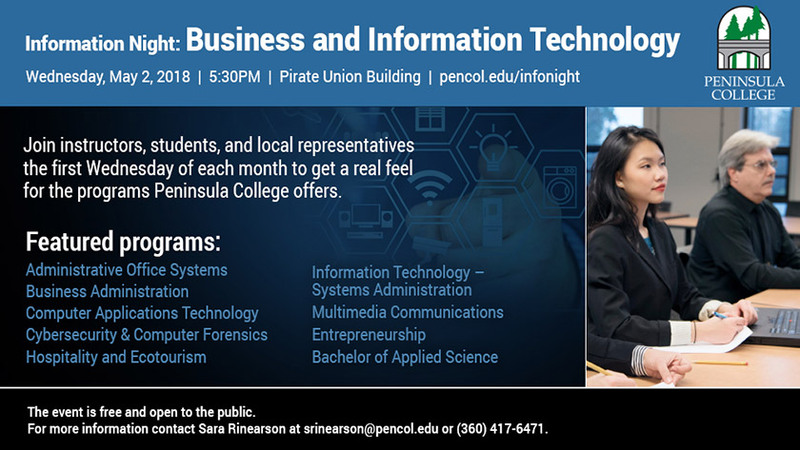 May’s PC Program Info Night event will focus on Business and Information Technology Programs, and will be held in the Pirate Union Building on the Port Angeles campus May 2, beginning at 5:30 pm. Prospective students or community members with questions are encouraged to attend. Programs featured will include Administrative Office Systems, Computer Applications Technology, Cyber Security and Computer Forensics, Hospitality and Ecotourism, IT Systems Administration, Multimedia Communications, Entrepreneurship and Bachelor of Applied Science. Guests can meet instructors, students, and local representatives in the field, and take a tour of program spaces. They can also get help applying for admission to the college. The event is free and open to the public. For more information contact Sara Rinearson at srinearson@pencol.edu or (360) 417-6471.